Amani Coalition leader Musalia Mudavadi has come out to fight claims of seeking state appointment from the ruling Jubilee following his current calls for inclusive public appointments. The former deputy Prime Minister has called on his perceived political detractors to consider his gesture as genuine and should not be misconstrued to mean he’s desperate for Jubilee’s share of the cake. The UDF leader known for his relentless self-promotion accused President Uhuru Kenyatta and his deputy William Ruto of fueling ethnic tension in the country by ignoring calls for inclusive public appointment. However, political pundits have maintained that Mudavadi is out- gun-blazing for relevancy in revenge from political cold out of the Jubilee pre-election agreement. 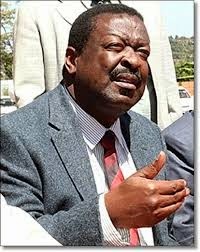 In a strongly worded statement dispatched by his by private secretary Prof. Kibisu Kabatesi, Mudavadi supported Cord in its push for inclusive public appointments, adding that it was the only route to diffuse the current ethnic tension that has engulfed the country. His statement comes at a time when Raila Odinga Cord led coalition openly signaled its willingness to reunite with the Amani leader as the Western region tries to galvanize votes a head of 2017 general elections.